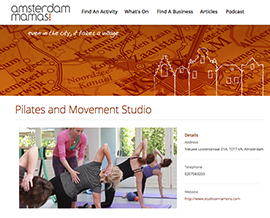 Studio Anna Mora has a partnership with Amsterdam Mamas. For these Mamas we have Special Offers. As a mother it can be challenging to exercise on a regular basis, or adapt to the physical challenges prior to and after labor. We guide you to train in a targeted, yet mindful way so your work-out is both safe and time-effective. Are you a member of the Amsterdam Mamas community? Please contact the Studio for more details on our offers at info@studioannamora.com or 020 – 75 83 255.